When Britt Reid, Jr. aka the Green Hornet goes missing, Century City begins to fall into chaos and it's up to his old partner Kato and his daughter Mulan to try and fill the void. 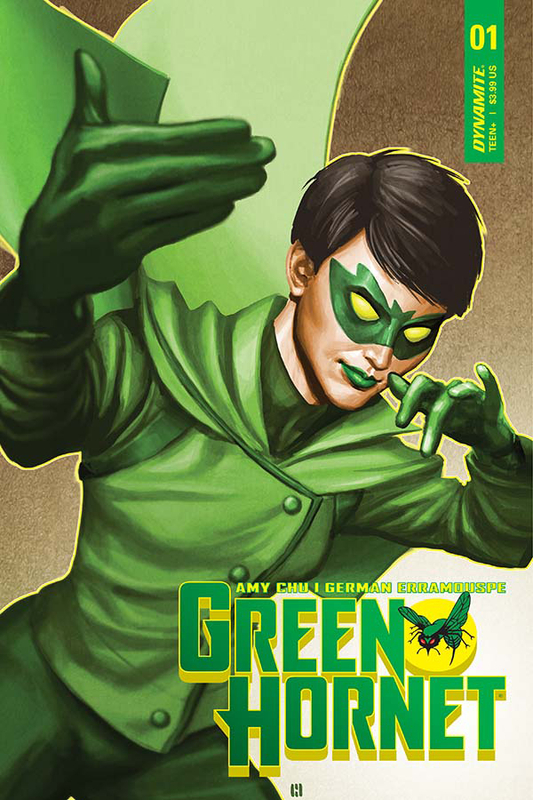 What makes 'Green Hornet' such a fun read isn't the story necessarily since the solicitation gives away what happens. The execution by Amy Chu, German Erramouspe, and Brittany Pezzillo is pitch perfect as it hits all the right notes leading to Kato and Mulan taking over to become the city's protectors. They'll try to figure out what happened to Britt since his disappearance from a friend's yacht party while they restore law and order to the streets now running rampant with Green Hornet copycats. Kato Hayashi was Britt's crime-fighting partner but now he has to assume the role of acting publisher with Britt off the grid. The Daily Sentinel is in trouble, with a changing media landscape, a potential hostile takeover looming, and journalistic questions regarding the coverage or non-coverage of their missing publisher. If that wasn't enough, Kato also has an impatient daughter ready to hit the streets to take Britt's place. She's more than capable since she had the best trainer in her dad. As the crime rate begins to soar, Kato has no choice but to police the streets and look for clues to find Britt. Chu's dialogue and pacing are natural and not rushed. Despite the predictability of the opening issue, Chu demonstrates a sincere respect for these characters and its history. Britt is revered and Kato takes his job seriously. Kato feels a sense of duty but knows he can only do so much. He realizes Mulan is ready to step in when she gets the better of him in a surprise sparring session. Kato is an honorable person, concerned for his friend's safety, the future of his publication, and of course his daughter. It's hard to dislike this new series even if it feels too familiar because it's so well produced with so many likable characters. Erramouspe and Pezzillo really propel the issue with efficient layouts and subdued colors with the emphasis on green of course. There's one fun fight sequence that's choreographed well and the build up with all of the classic Green Hornet cars and gadgets is just what any fan would want to see. The art gives the issue the energy it needs with so much set-up taking place. 'Green Hornet' is a fun new series with a revamped line-up under the masks as they search for Britt. This is a solid start that plays it by the numbers but makes it no less enjoyable. The real test will be what happens in issues two and three with the set-up out of the way and the mystery unfolding. This could be the beginning of a pulpy new adventure for a new generation.